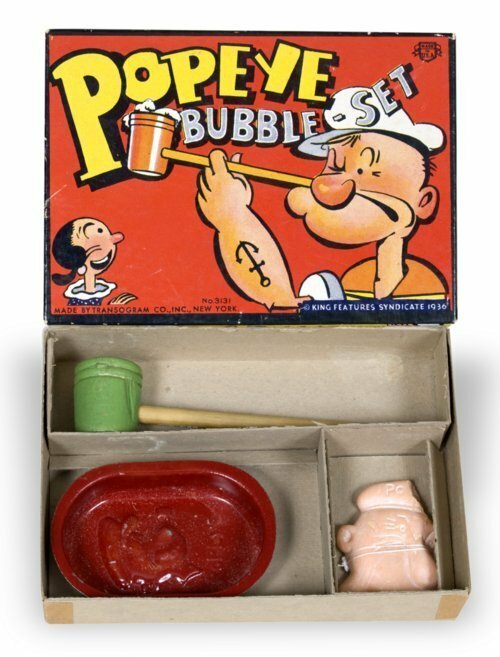 This Popeye bubble set includes a pipe with a painted wooden bowl and hollow bamboo stem, a tin tub with Popeye's profile to mix soap and water in, and soap in the shape of Popeye's profile. The box features Popeye and his wife Olive Oil. This set was made in 1936 by the Transogram Company in New York. William Kvicala, who was born and raised in Nortonville, Kansas, owned this set. Popeye is a sailor who gains superhuman strength by eating spinach. He is considered a precursor to the "superhero" comic book character. He debuted 1929 in the Thimble Theater comic strip. Beginning in 1933 Paramount began producing Popeye animated shorts. The combination of comic strips and film made Popeye one of the most popular animated characters of the 1930's of which merchandising played a roll.